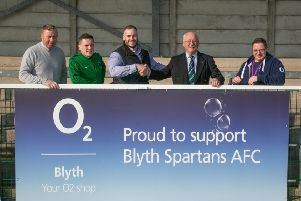 Blyth Spartans maintained their 100 per cent early season record with a dramatic injury-time winner against Buxton. Dan Maguire was the man to finally break the deadlock in the first minute of injury time to ensure Tom Wade’s side made it three wins in a week and see off a determined and organised Buxton side. Unsurprisingly, Wade chose to field the same side that had won a titanic battle with Whitby Town four days earlier, meaning Stephen Turnbull made his 150th appearance for the club. The early stages were played at a frantic pace with the visitors on top. They had the first sight of goal but striker Liam Hardy getting too much on a Jamie Green cross from the left and sending his header well over Adam McHugh’s crossbar. Spartans response was a snap-shot from Michael Richardson as the midfielder raced on to a quickly taken free kick from Alex Nicholson before firing just past the near post from an ever-narrowing angle. The pace of the game finally slowed down to something approaching manageable and the chances were few and far between. Arran Wearmouth tried his luck from distance but fired well wide of Phil Barnes’ far post. Liam Hardy was a constant threat to the Spartans back four and, despite the loss of strike partner Sean Tuton, he remains more than capable of troubling any back four in the league this season. With half an hour on the clock the frontman found some space on the left hand side and sent over a floating cross that took McHugh out of the game. However, the majority inside Croft Park were relieved to see that no Buxton player had gambled on the cross heading towards the far post and Spartans cleared to safety. As half time approached the hosts took control of the game. Some neat interplay between Maguire and Robbie Dale led to the latter curling wide from just inside the area before a last-ditch block from the impressive Greg Young denied Richardson as he seemed set to fire home from inside the visitors area. Half time came with the deadlock unbroken, perhaps unsurprisingly given the quality of the two defences of show. Just as they had in the first half it was the Bucks who dominated the opening exchanges of the second. Warren Burrell glanced a header wide of the far post as he rose above everybody to meet an Ash Burbeary corner before Bradley Barraclough matched his team-mate with a similar headed effort that produced the same result. Again Spartans upped the pressure as the half wore on. Maguire dinked an effort just wide of the far post when played through on goal, perhaps expecting an offside flag that never came. Robbie Dale was growing in influence throughout the half as he tormented his marker with a neverending array of twists and turns. His finishing couldn’t match the trickery though as he curled well over the bar after latching on to a Nicholson cross from the right. Finally the visitors impressive back four relented in the first minute of four added on. Nicholson, impressive once again, surged towards the edge of the Bucks area before colliding with Young. The loose ball ran to Dale on the left hand side of the area and his cross fell kindly via a deflection to Maguire, who calmly applied from finishing touches from point blank range to send the Green Army wild. Spartans comfortably saw out the remaining moments of injury time and can look back on an impressive first week of the season as they head into a tricky trip to Ashton United on Tuesday night.